Stadler Form specializes in products that combine ultimate functionality with chic decor enhancement. 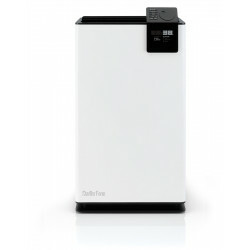 Their dehumidifiers are stand alone units that do not require a drain line, but can be emptied. These units protect your home from mold and wood warping by reducing the humidity to level you set, without any extra effort on your end. Popular models are: Albert Dehumidifier .